At times you may need the IP address of your Shared Hosting server. This information is contained in cPanel. You can easily find this information by logging into cPanel. Please see our education channel for more information about cPanel. On the right side pane, click on the link labeled Server Information. Scroll down to find the Shared IP Address. The IP address listed in the Server Information page is the Shared IP Address of the server you are on. If you need further assistance please feel free to ask a question on our Customer Community Support Center. I don't have a shared IP adress on my Cpanel, Only Dedicated IP Adress, Is that normal ? Yes, that is normal based on the hosting plan you have, or if you purchased an SSL. I've the following code, which I am using for my android app. Previously the hostname was written clearly. Now I am using cPanel and can't figure out what value should be givn to $host variable. Typically you can use your domain as the hostname. But you can view your server's hostname in AMP, in the Account Technical Details section. How do I access my site using just the IP. I don't want to change the bameservers until I have migrated Wordpress. I suggest using a Host File modification to test your WordPress site. The ~username thing is what I was looking for. Thanks! But my friend access my cpanel using diffrent password using some ip address, he used to open this account with his password and i have my diffrent password. is it possible to access like this. Hello, I am having an issue. My website shows to be hosted on a domain in cpanel, but when I try to connect to fillezilla to the domain name, it shows a different ip address. Also, when I ping the url, it displays a different ip address than the one from the domain address. x-photo.roWhat could be the problem? The ip address it shows is not from my server. Thank you in advance. Thank you for contacting us. I looked at your domain's Nameservers, and they are pointed to Cloudflare. In this case I recommend using your "server name" instead of your domain, since it it routed through a 3rd party site. 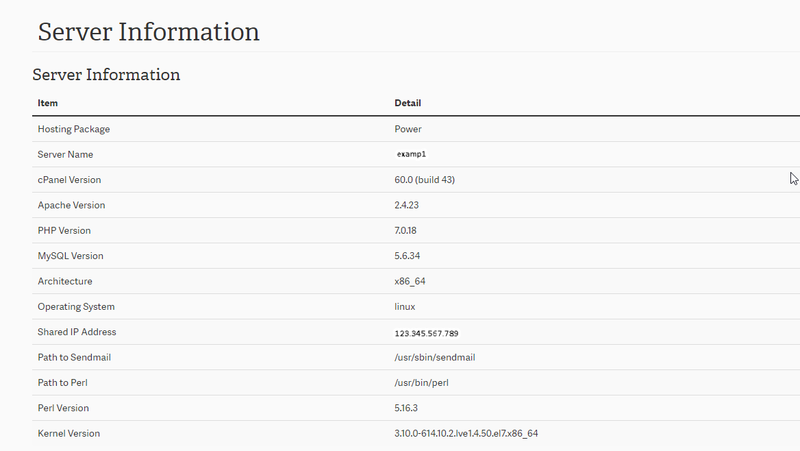 You can view your server name in your cPanel stats. Why is there no ip address shown in my cpanel?? Thank you for contacting us. I checked your cPanel, and it is not showing because you changed the default theme. You can still view your shared IP address by clicking the drop-down box below Switch Theme, and select x3. I changed my layout to x3 and the shared ip address is not listed on cpanel under expand stats. Any help as to why that might be? That is quite unusual. If you have a custom server setup, you may not have a shared IP. If you are hosted on our servers, I recommend contacting Live Support so they can test your specific account. why is my website is not pulling sometimes?do you have any idea about it? Sorry for the problem that you're having. Unfortunately, your question is very vague. "Why is my website not pulling sometimes?" Are you referring to not being able to get into your website? Do you have another problem? This article is about finding your Shared IP address. If you're referring to another issue, please post a question in the appropriate area or as a comment under the article associated with your problem. you can also connect with Dedicated IP Address. It didn't come up when I searched for 'Keep My DNS Servers" or "What is IP Address of Server"
I suppose I could have pinged the temp url.. but not sure if it will remain the same. Is the IP address not showing up when following the instructions above? I can see it from within your cPanel from here. Also, 'temp URL' is a bit of a misnomer. It does not mean that the IP address or the URL will change, it is always there and functioning as your account. It is simply used 'temporarily' until people get the domain name pointed to us. But pinging the temp URL will also give you the correct IP address for your account as it will not change.